Saturn is the bad guy of the planets. Or so it is told. 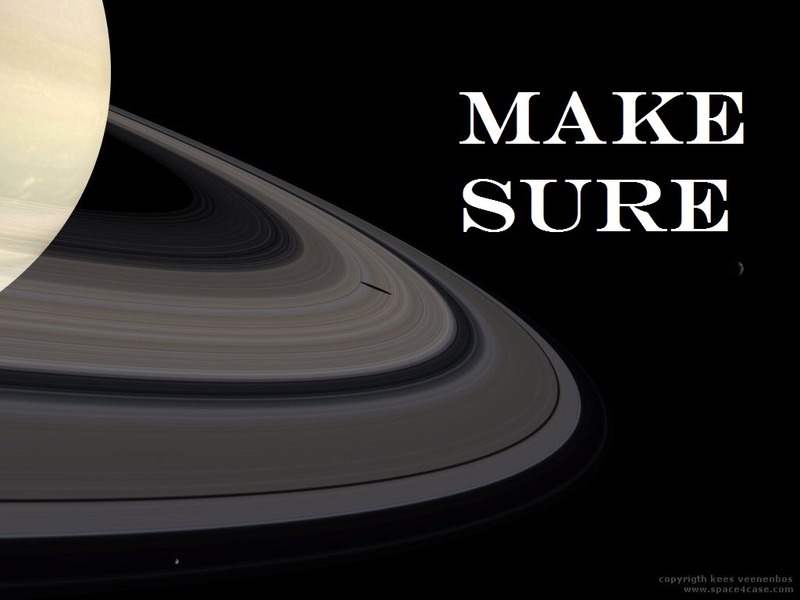 However, if it weren’t for Saturn, you wouldn’t be here – it’s that simple. After working with this stern planet for a very long time it has become very obvious to me that he is up to one thing, and at all times: MAKING SURE. That’s what he does. And that’s what all Capricorns do too, since that’s the sign that he rules (SC). Throughout history, he has been much maligned, being famous for restriction, limitation, fear, depression and all other types of goodies. Many times it’s misunderstood. Certainly, if your particular natal Saturn is so heavily placed that you are not experiencing the plus side of this ringed planet, it will present problems. You see, its NATURE is to make manifest, to make concrete, to make into form, to coagulate therefore, when it is doing its natural thing, it makes sure of itself. When a job needs done at work, you always give the job to the SC, if you really need to make sure it gets done. (Unless there’s a Virgo around). But that’s not because it limits. It forms. It rules regulation, systems and organization. That is imperative for any system or society to be workable and effective. SC is the most responsible/dependable of all planet/sign combinations in the zodiac. Other signs can waiver from their true nature, but all Capricorns have a great sense of DUTY and RESPONSIBILITY. That’s their job. It is their essence. You can’t teach 10 kids to drive a car by piling them all in the car at once. At least 6 are going to have to wait their turn. That is order, not limitation. There’s the difference. The teacher can get carried away and become power-hungry or limitation-hungry (bossy and controlling) if they don’t watch themselves. Saturn is synonymous with “be careful.” ALL Capricorns say “be careful” as they wave good-bye to you. It’s just their instinct. Are you making sure? This is also why we all don’t crash and die at red-lights; i.e., we have a system. Yes, half of the people at a red-light have to wait, but that is called regulated social order. When rules are broken, untoward things happen. This is where Saturn gets its reputation for being limiting. So many people “grow up” at the age of 27-29 once Saturn returns back to the place where it started at birth for all of us. That’s because inside, we naturally accept our own limitations at that time. We suddenly learn that we aren’t unlimited; we know we can’t fly; or live at the beach and eat sand forever and survive. Saturn established sane order – if we haven’t become totally incapable of following order. Many people do in fact have too strong of a SC in their charts and these unfortunate, up-tight folks will manifest the “malefic” tendencies of this huge father-like planet. Since its SC nature is to make sure, it also leads the native to not trusting or appreciating what they already have. And if you don’t trust, you don’t live. Period. What happens to a leaf when it doesn’t trust the nutrients given it? It dies. Simple. When you let go, you breathe. Naturally. You get fed. You cannot control life, we all know that. This is the big myth of SC; if you control life and live within the societal rule-box, it will all work out. That is the big lesson for Capricorn as well as all the earth signs. This is what leads many SC types to forfeit their individuality because they become so afraid and abhor risk and instinct. Bad choice. Very crippling. So, the art of working successfully with these archetypes is to make sure you “get your job done” without being too controlling and fixed. Flow just has to be the number one trait in all people’s lives or else we become detached from Source itself. How can you flow while making sure? That is the question here, and the art. So, the difference is between SC’s reputation of limitation and their true essence of making sure. A fine line. We all know the feeling of being in the flow as life “works”. That’s the mastery of Saturn and Capricorn. That’s why Capricorn resides at the top of the zodiac. It’s symbolic. This is also why SC is synonymous with depression and fear too. If you are not allowing life to flow, then life energy can’t enter your system – you are cut off. You have knowingly or unknowingly cut yourself off. Depression has to result. “Depression” comes from the verb “depress,” which means to PUSH DOWN – or, turn off. It is an active verb. After time, it can become a (non)state of being, eh? Letting go can be the most fearful thing we can do as we are urged to trust the Source of life. In actuality, there is no other choice. This is one reason that people with very strong SC aspects in their personal natal chart suffer from rigid joints. No wonder. Still, as with all planets, you will get residual effects in your life when transiting Saturn acts up in your chart. These types of things are common: bone-related problems, aching knees, skin eruptions (covers the whole body), and possible serious dental issues (all the hard parts of the body.) In terms of our “practical” life, it is very common to experience added responsibilities especially if you have been ignoring them. Another very common manifestation during Saturnian times is having to go “back in time” and take care of your parents, even if it means leaving your job, moving and having to help out in their waning years. Yes, much is written about Saturn and that over-used word: karma. Don’t be fooled, Saturn also rewards us for a job well done. No matter what you do, you will have to buckle down and tighten your belt for a rainier day, that’s just how Saturn works. During Saturn transits, the Saturn inside you surfaces as you become tired of your life not working and become (hopefully) ready to deal with whatever you have to do to turn things around. It’s not magic. The charts of the most successful people I’ve ever seen have very active Saturn placements such as conjunctions, squares and oppositions to Saturn. Why? Because these folks have had to earn what they have by working, as opposed to pining for a mythical silver platter to occur. Remember, the phrase is to make sure. In the ultimate scheme of things, only a higher power can actually make sure that the unmanifest manifests in a successful manner in your life. It is high time that Saturn got its rightful due – that it be respected for the critical, pivotal planet that it is. If your natal Saturn is strong, then give yourself a pat on the back for being so dutiful. But, “make sure” that you are not always “making sure” to your detriment. Seriously. Leave room for slack and flow while expecting the unexpected. Saturn is wise and that means wise enough to laugh at its own appellation as the shepherd of life. No matter what chart you have or what Sun sign you are, the art of astrology is discovering more about yourself and placing yourself in the proper perspective; in sync with a higher dimension. PERMISSION MUST BE GRANTED BY THE AUTHOR IN WRITING FOR USE IN ANY WAY. Rick DiClemente has been publishing the Starself Astrology Newsletter for over 9 years. Subscribe now to receive Rick's upcoming newsletters in your email inbox as soon as they are published. Please be sure to confirm your subscription request via the confirmation email you will receive after submitting your info above. Thank you for your interest in signing up for the Starself Astrology Newsletter by Rick DiClemente.